A couple months ago, Lydia and Nate began horse riding lessons. 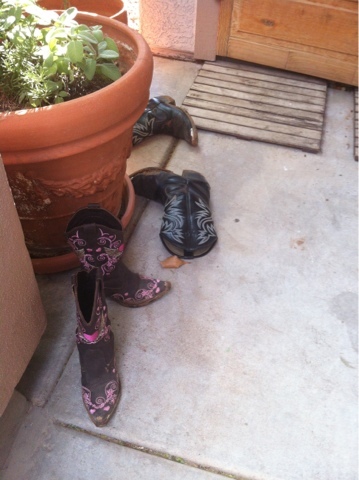 Nate purchased his boots last summer in Texas; Lydia received hers as a birthday gift from her uncle. They are both proud of their boots, and love wearing them. They wear them for each lesson, and they came home usually caked with mud and . . . well . . . poop. So, they sit on the front stoop until they are washed off and ready for another horse riding lesson! Ringling Circus in Phoenix - Review! Wendy's Berry Salad is back! National Donut Day & Entenmann's Giveaway!